19 Sep Super Saturday: Sept. 19. Saturdays are often busy; this one’s busier. Today we have four (4!) things to pick from in different parts of the state, so no whining about being bored, kids. Tri City BBQ Fest in Denison, all day. Little Giant Beer Summit at el Bait Shop in Des Moines, 3-7pm. 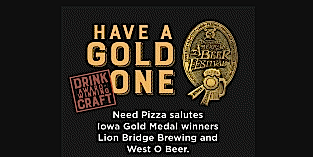 Gold Medals FTW at Need Pizza in Cedar Rapids, all day and probably into next week. Live music in the West O tasting room: Jacob County and the Damaged Goods, 7-10pm.